She certainly found motivation in an unlikely place, but she stuck with it. Many of us have discovered habits and practices that are very life-giving for us, but we lack the motivation to do them. We know that exercising, eating a balanced-diet, getting quality sleep, praying, journaling, and other practices like these can help us live life in abundance. But we usually tell ourselves we do not have the time. What's stopping us is not the lack of time; I bet you would find time to do something you deem more entertaining. What we lack is motivation. Every now and then, we complain that praying – or other life-giving practices – is too hard, and we do not know how to do it. It is true; with so many how-to books, websites and experts out there, we would have utilized these resources if we really wanted to learn. We just lack motivation. Occasionally, we let procrastination get in the way of exercising or journaling. That too is pure lack of motivation. When our minds are engaged. When we recognize and visualize the benefit of whatever it is that brings us life, we make a conscious decision to act. In those moments, stay with that decision. Write it down. Create a plan. When our hearts are ignited. To me, this is the best way to be inspired. People seldom act because they find an idea appealing. They act because their hearts are touched. Imagination and love are the best ways to ignite a heart. The Heart of Jesus can ignite our hearts in ways that transform us and motive us. Let God set your heart on fire. Act. Nike got it right: Just Do It. Motivation actually emerges from the soil of action. Julius Caesar said it best, “If motivation is what you're seeking, it's a mistake to just sit around and wait for it to strike.” Don't sit and wait for the motivation to start praying. Pray. Transcend the thoughts and feelings at that moment. Do it. As you start to pray, exercise, journal or eat well, have fun with it. Do not let a goal-oriented attitude drain all the fun and joy out of living abundantly. It takes time for those practices to become habits. So, be your best cheerleader: if you tumble, get up and start over. Try, try, try. Work hard and stay focused. Rome wasn't built … you know what I mean. Living abundantly does not just happen overnight. When you struggle doing the things that give you life, find a good friend – a companion – who keeps you humble, accountable and joyful. It helps to share our progress with others, but also to be inspired and encouraged by others. With time, you might even develop a community of people looking out for each other. 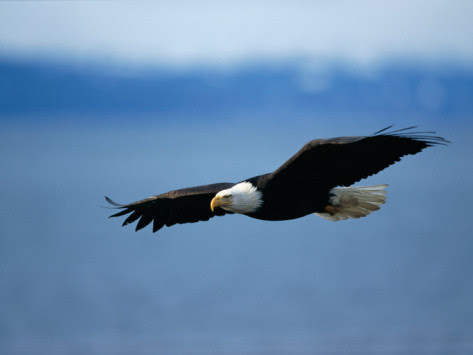 There is only one thing cooler than one eagle soaring: many eagles soaring high. Don't be afraid to fly with eagles. Open your mind. Let God ignite your heart. Act. Pray. Be joyful. Fly like an eagle. Thank you Sharon. I am always learning and sharing what I learn. You remain in my prayers. Me encantó Santi. Tus palabras inspiran y dan vida! Gracias por tu amistad!